I am pleased to announce that I have been asked by SCUBA magazine to contribute to a monthly photography column which makes its first showing in the January 2015 edition. The column is called PHOTOQUEST. I am co-authoring this feature with Charles Erb, who I have been diving with for many years now. 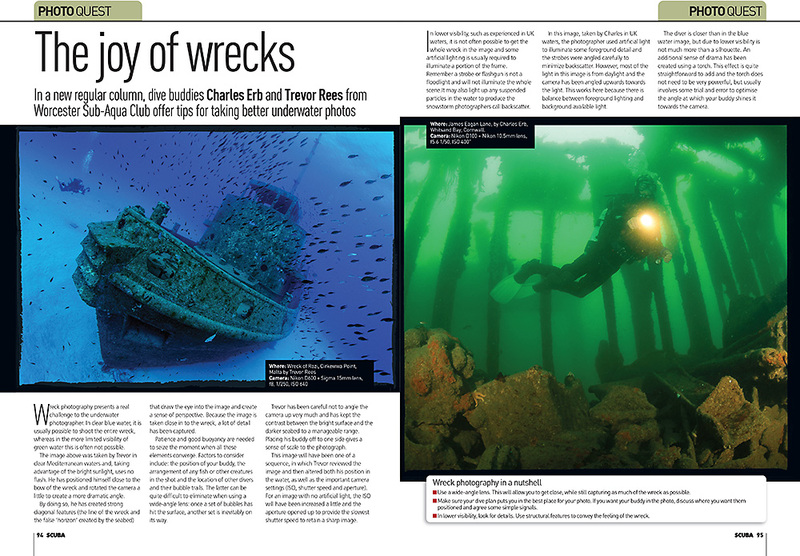 We kick off the first feature with a look at photographing wrecks. Each month the column will show a couple of images and the aim is to write some useful photographic tips for aspiring underwater photographers. We aim to have a strong emphasis on UK subjects which should appeal to BSAC divers and also not be too heavily biased towards SLR shooters. The text is not easily readable in this photo...... you'll have to get the magazine for that I'm afraid.